For the most part cleaning blinds and shutters is a fairly simple process. Of course not all blinds should be cleaned the same way. What is a good idea for one blind may damage another. We’ve divided the blinds into materials in order to give guidance. Some say these are the easiest to clean, some say they are the hardest. The reality is there are many types of fabrics. If you can think of a fabric, someone has made a blind or shutter out of it. Just like some fabrics are easily cleaned, others are very difficult. Let’s review some basic guidelines. Pay attention to labels. It’s important you know what you’re fabric is and what the label tells you about it’s care. Like most fabrics, fabric shutters and blinds will often have a label that tells you just how to clean them. Consider that your primary guide for their care. Some will need to be dry cleaned. Others will need to avoid strong chemicals and bleach. Others will need to be hand washed. Plan to take some things apart. This is a guide for all blinds, but remember to take out any metal or wood mechanisms before cleaning. Water submersion can damage these irreversibly. Speaking of irreversible damage. Water warps wood. So the cleaning of wood slats is particularly challenging. Follow these guidelines. Treat like you would any wood furniture with varnish etc. Most of the time there is a layer of dust that needs to be brushed off, use a dry cloth. A wet cloth will warp the wood. If you have spots on the wood that need cleaning with a wet cloth, make sure you have a dry cloth handy. Only use pure soaps with no chemicals. But most importantly, dry the wood off as soon as you get it wet. It’s important to stay on top of this. These can be soaked in soapy water as well. Remember to take apart any mechanisms to avoid water damage. If the slats are permanently fixed, you can actually clean them while hanging. Start by making a solution of water and a pure soap with few chemicals. Spray the slats and wipe them down as you go. With vinyl you need to be careful not to apply too much pressure. The blinds can be broken when pushed on too hard. Remember to clean your blinds regularly to avoid hard dust build up. 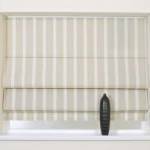 When blinds are simply dusted off regularly they tend not to be as difficult to clean.